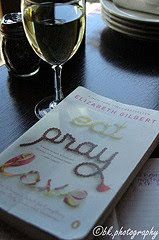 Lover of travel narrative that I am, I adored the book, Eat, Pray, Love. So I planned to see the movie the day it opened. The previews looked so good! Who better to play the main character than Julia Roberts? I went to see it with a couple girlfriends Friday night. And it was fantastic! And pretty close to the book, from what I recall, having read it years ago. Julia is perfect. Go see it! Like now.